Happy Monday everyone... I was up on the Markerpop Blog on Saturday with a Fall card and video. 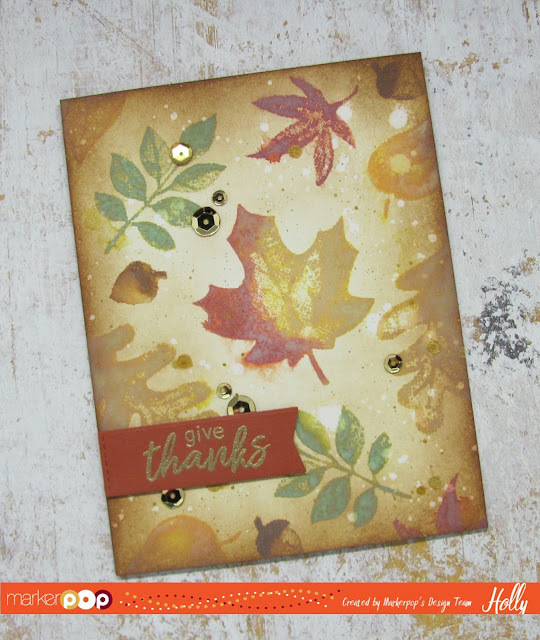 The Newton’s Nook Designs September Release is now in the MarkerPop store and the new Shades of Autumn is a must have for all your Fall crafting!! I started with a piece of Tim Holtz watercolor Distress card stock and I stamped each of the leaves several times using Fired Brick, Peeled Paint, Wild Honey, Fossilized Amber and Vintage Photo Distress Oxide Inks. I stamped each image into the ink and then I spritzed it lightly with the Distress Sprayer. Then press the image onto the cardstock and let sit for just a few seconds and lift. You will get a different look depending on how much water you add to the stamp. Once the background images were all stamped I added some more water to move the color a little and dried the panel with my heat tool. I added some Vintage Photo Distress Ink around the edges with a Mini Ink Blending tool. I added a few water splatters and removed the excess with a paper towel to create the Distress look. I wanted some gold so I added a few splatters of Distress Spray Stain in Tarnished Brass. Then I dried the panel and adhered it to the card base. I created a Banner with the same color cardstock and the MFT Blue Prints #29. I stamped the sentiment in VersaMark ink and heat embossed with Gold Embossing powder. I adhered it to the side with some foam tape and added some mixed Gold Sequins for a little sparkle. You can save on your favorite Newton’s Nook Designs stamps and dies in the shop now until 9/19. That's a gorgeous fall card. Congratulations ! This is a gorgeous fall card, the colour are so perfect !